In keeping with this month's focus on growing patterns, use the math templates below to help students organize data in input/output tables. Students can then analyze the data, looking for patterns. Verbalizing these patterns helps students write the pattern in words and then translate those words into mathematical notation to write a general rule for the nth term. Older students can graph the ordered pairs and analyze the graph representation of the function as well. Classroom Management: Insert student templates into sheet protectors. Students use dry-erase markers to record information for each problem. Using student templates is an excellent strategy for increasing active participation of all students. This strategy also provides teachers with formative assessment as they circulate around the room, monitoring student progress and assisting students, as needed, on an individual or small group basis. Overhead Transparencies: Teachers should use the same template on transparency film inserted into a sheet protector on the overhead so that students can use dry-erase markers to explain their thinking. This allows students to use dry-erase markers and erasers on the transparency, eliminating the use of overhead markers and wet wipes to clear them. Additionally, if the overhead is exactly the same template that the students are using, students can simply remove the paper from their sheet protector and insert the blank transparency template to use at the overhead to show and explain their work. This is an incredible time-saver. 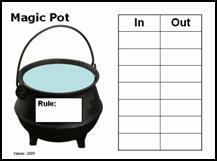 Magic Pot and In/Out Table based on the magic pot in the Two of Everything book, is an appropriate introduction to the function machine and input/output tables when used with concrete manipulatives and a magic pot. 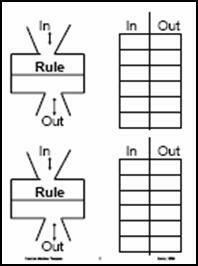 Function Machine & Input/Output Tables encourage students to organize data and write a rule. See more templates in Template Library. See more information on Using Templates to Increase Active Participation.